Patrick and Melissa are a treasure trove of linguistic anomalies. Wetlands...Oof! I just didn't know what I was in for. I'll give it another shot...in about 10 years...when I've had a chance to recover. The more I think about Landis never accepting responsibility for his part in the tragic deaths of three people on his set the more angry I get. Sorry that this was my main takeaway from this episode. I enjoyed Soaked in Bleach more than Montage of Heck. But that might be because I'm a big mystery/conspiracy theory movie fan, and Soaked in Bleach plays out almost beat for beat like a noir mystery film. (Which I suppose is somewhat exploitative, given that fact that its a true life tragedy). However, I would encourage you to watch it. It's well directed, well thought out, and provides some pretty compelling first hand testimony and evidence. This is one of the few Stallone movies I've never seen, I'll definitely need to check it out after such a passionate defense. I really thought this was about the Oscars, as in the Academy Awards being the time of it and all. Silly me. I remember seeing this when I was 13 or 14 and liking it but when I heard everyone else say how bad it was I succumbed to teenage peer pressure and went along with the crowd which is a perception I held onto for a long time. Any time it came on tv since I dismissed it as not being very good but now after listening to this podcast I'm ready to go back and see if 13 year old me was right all along. Thank you for this episode! I'm one of the twelve Oscar-enthusiasts. I watched it when I was thirteen and absolutely loved it. It's been a once-a-year watch for me every since. When my local video store weeded out their second VHS copy, I bought it. When they weeded out the other copy, I bought it just in case the other tape broke. It's still one of my absolute favorite movies - one of the funniest films I've seen. At the time, I'd seen some of the screwball comedies that inspired the film and being a weird kid tried to get my friends to like My Girl Friday (they did not), The Thin Man (they did not), and Oscar (yeah, they did not). I was flummoxed then, and I'm flummoxed now. Like Melissa, I cannot find anything wrong with the film. I'm even a fan of Stallone in the role. His slack-jawed, incredulous reactions in his increasingly chaotic morning are perfect. Again, thanks for the excellent episode! Add me to the list of new Oscar fans. I rented it in preparation for listening to the podcast. I was thoroughly entertained. As you said in the podcast not all of it works, and it was a little too long, but I'm glad I saw it. Hard to say this was Tim Curry's finest hour, because he's had so many, but he was magical in this. One of the twelve here...and by my count not all of the twelve have commented! Come on Oscar-ooneys? Well that hardly works, but 1991's Oscar really really does. I discovered this one as a kid as well and was thoroughly taken in by how funny and entertaining it is. It is hilarious, tightly scripted, contains fabulous music, an incredible ensemble cast...I'm not sure if it has been re-evaluated with the passing of time, but the reviewers were wrong then, and if they haven't changed their mind, they still are. Also so glad Patrick mentioned my absolute favourite part of the movie: Dr Pool's ridiculous "head popping into frame shot" saying 'Hellloooooo.' Not sure why it is so funny but I'm glad Patrick seems to agree that it is. So glad this got a podcast. 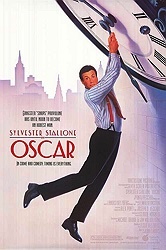 I absolutely NEED a lost of movies of which Oscar is paying homage. I just finished my first viewing (rental), ordered the DVD, and am fully prepared to sign (and possibly riot) for the blu-ray release. I know Patrick mentioned searching for classic screwball comedies - any idea where to start? His girl Friday, Bringing up Baby & What's up doc? As mentioned below. It happened one night, My man Godfrey, The philadelphia story, and be sure to check out Ernst Lubitsch movies, especially Ninotchka! This is when I stopped following the podcast. I had been on a binge podcast run for a while and catching up to the latest podcasts but when this came out (around the same time the oscar ceremony) I mistakenly assumed this was about the movies nominated for the oscars. I thought it was funny until the podcast started with comments of "you should have known if you followed our website and blah blah blah only true fans blah blah blah". It came accross in such an elitist fashion that I stopped the podcast, unsubscribed and forgot about it. The good thing about your podcasts is that are entertaining and most importantly approachable. Unfortunately, the start of Oscar felt so preachy and if felt like it came from a movie snob. Not your style.